This article submitted by Michael Jacobson on 8/23/00. The proposal for a new airport met opposition from surrounding landowners during a public hearing to explain the zoning requirements of the new strip. The city of Paynesville and Paynesville Township established a joint powers board last spring to build and maintain a new airport in Paynesville. A zoning board was also formed with representatives from the affected areas: the city of Paynesville, the townships of Paynesville and Roseville, and the counties of Kandiyohi and Stearns. Following guidelines set by the state, the local zoning board made a zoning proposal for the local airport and the surrounding area. The meeting, held on Tuesday, Aug. 14, at the Paynesville Area Center, was required to explain these requirements to affected landowners and to receive input from them. Around 30 residents attended the hearing. Many of the speakers wanted to discuss more fundamental questions about a new airport: should it be built, where should it be built, and how much it would cost. The proposed site is just to the west of the current airport. The proposed hangars would still be accessed from Cemetery Road but would be a quarter mile or so farther from town. The new strip would be run closer to the east-west axis than the current strip, which runs from northwest to southeast. The city of Paynesville and Paynesville Township, through the joint powers board, expect to purchase land for the hangars and the strip. Surrounding land would face restrictions, in land use and in height, to keep the strip safe for air traffic. For land use, the most severe restrictions would be in Zone A, which extends in a cone 2,667 feet beyond each end of the runway. Buildings are prohibited in Zone A. Allowed uses include agriculture, wildlife habitat, nonspectator outdoor recreation, cemeteries, and parking lots. Building requirements are limited in Zone B, which extends another 1,333 feet beyond Zone A. Houses are allowed, but building lots must be at least three acres in size. Limits to the number of people at a site is also restricted. For each acre of land, 15 people may gather, meaning a house on a three-acre lot could have 45 people. A house on a ten-acre lot could have 150 people. Churches, hospitals, schools, motels, campgrounds, and other places for public assembly are prohibited in Zone B by the proposed ordinance. 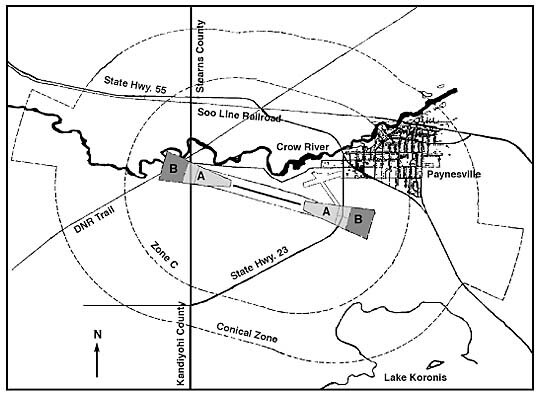 Circling the ends of the strip with a radius of 6,000 feet is Zone C, which includes part of the city of Paynesville. For land use, this zone faces only two restrictions: using communications equipment that causes interference to aviation channels and using lights that may be confused with the runway lights. The zoning ordinance also includes height restrictions to prevent airspace obstructions. In Zone C, for instance, no structure can be built or tree allowed to grow more than 150 feet above the elevation of the strip, which is 1,330 feet above sea level. On ground that is the same level as the airport strip, the height restriction would be 150 feet. Should the land be 100 feet above the strip, though, the height restriction would be 50 feet. Beyond Zone C, a conical zone extends the height restrictions an additional 200 feet in the air. This restriction is sloped over 4,000 feet horizontally. Further restrictions also are needed for the ends of the strip, a so-called approach zone that extends beyond the conical zone. A zoning administrator would handle permits in these restricted areas, and a board of adjustment would be established to handle variance requests for these zoning requirements. Much of the public input at the hearing centered on the airport proposal, and did not specifically address the zoning requirements. Pat Meagher, who owns land adjoining the airport site, urged holding a public referendum on the issue. Previously, at the Paynesville Township meeting on Monday, Aug. 14, Meagher brought a petition to the board of supervisors that asked for a referendum on the Paynesville Joint Airport Zoning Board. Meagher's petition had signatures from 200 township residents. "When are we going to have open discussion about all this?" Meagher asked. "Is it all said and done?" The request for a referendum faces a legal hurdle. Some expenditures require a public vote, but this is not one of them, according to attorney Bill Spooner, who represents the city and the township. "As far as I know," Spooner told the zoning hearing audience, "it's against the law for the city or the township to spend money on a referendum that is not required by law." On several occasions, Spooner, Phil Bailey, chairman of the zoning board, and city council member Dave Peschong urged people with more fundamental concerns about the airport to direct those to their elected officials at city council or township meetings. Peschong told the audience the meeting schedule and urged interested citizens to call in advance so they could be put on the respective agendas. The city council meets the second and fourth Wednesdays of each month at 6 p.m. The township board meets on the second and fourth Mondays of each month at 8 p.m. While the council and the township have directed the airport commission to build an airport, those governing bodies still control the purse strings, Peschong said. "In effect, the city council and the township board have the power to stop the airport by not approving the finances," he said. Construction costs last spring were estimated at $1,257,000. The Minnesota Department of Transportation (MnDOT) would pay the first $200,000 and 60 percent of the rest. The estimated $400,000 in local costs would be split by the city and the township, based on the joint powers agreement. The five-member airport commission meets on the second Wednesday of each month at 5 p.m. in city hall. It is comprised of Peschong and Steve Whitcomb representing the city, supervisor Don Pietsch and Steve Brown from the township, and Bert Stanley as an at-large member. Following Meagher at the zoning meeting, Jason Mages said he had attended meetings, asked questions and felt his questions had not been answered. Two elected officials questioned the airport proposal at the hearing. Harlan Beek, a member of the city council, questioned if the airport commission could purchase land, which he thought was a right reserved exclusively for the council. Beek also wondered if the airport should be built next to town and the school. "It's my way of thinking that's an awful stupid place to build an airport," he said, drawing applause from the crowd. Township supervisor John Atwood recounted how the joint powers agreement got passed by the township board and that he voted against it. After the meeting, Meagher said that he doesn't oppose an airport, but he wants to know what the public wants before his land is used for it. "If it got voted on, I could live with it better," he said. Mages said he didn't think airplanes should fly over the school and that he opposed the airport because he didn't think he would be able to grow corn next to it any more. Both charges were refuted by Tom Foster, an engineer for the city's firm of Short, Elliott, and Hendrickson, who explained, "The restriction to the development would be on the end of the runways, not on the side." Audience members did have questions about the zoning restrictions, too. Mages also asked why the zoning was being done before land acquisition, when it seemed to him wiser to buy the land and then zone it. Mike Meagher also wondered why zoning was done before land acquisition. According to state requirements, this ordinance had to be ready and this hearing had to be held before negotiations with landowners could be held. MnDOT will review the zoning ordinance, and another public hearing will have to be held before it can be approved. That the zoning was being done according to state requirements led several audience members to wonder how much control existed on the board, and if they were being given a run around when they were told to search for answers elsewhere. Dennis Rothstein, another adjoining landowner, suggested that the zoning ordinance should include a sunset date. That way, if an airport ends up not being built, the restrictions would automatically lapse, which drew more applause from the audience. The airport commission hopes to purchase land through negotiations with land owners. Foster said state requirements for purchasing land require up to three appraisals if the two parties can't agree on a price. One appraisal would be done by an appraiser of the landowner's choosing (from a list approved by MnDOT). If an agreement still can't be reached, the matter would be taken to court through condemnation procedures. "The end result is the court establishes the price of the property, based on your input and the input of the government," said Foster. Foster also said that the law requires compensation for any depreciation of property due to zoning restrictions. But, he said, height restrictions normally didn't result in depreciation. Mike Flanders, whose family runs a horse stable in Roseville Township, in what is probably Zone B, said the zoning requirements would affect future plans for expansion. "I'm not sure how anybody can compensate us now for what we could do with that property in the future," he said. Flanders also asked whether the airport would affect the rerouting of Highway 23 when it is rebuilt as a four-lane road. MnDOT has the airport proposal and has agreed with it thus far, Bailey said. "I would think that the people at MnDOT who build airports would talk to the people at MnDOT who build roads," Bailey said. Dan and Lucinda Scheierl, neighbors of the Flanders family in Roseville Township, said they are building a campground on their property, a use which is expressly prohibited in Zone B. They were told that existing structures would be allowed. Once the airport is built, the board of adjustment could grant a variance to allow a prohibited use.